Congrats to Squid Larry for the winning entry and 50 duck prize. Thanks to everyone who entered and voted! Here are the final results of the Caption this Drawing caption contest. ""I hope Reed fixes this glitch soon""
Oh Dear... Another Youtuber Found Drawception. when Death by Squeegee submits a drawing. "Man, I never got to see the finished game!" So THAT'S where the nuclear launch button is! When you're asked to draw "divide by 0"
We'll end not with a bang, but with a click. Derailing isn't THAT bad for humanity? Right? Mom, Squeegee blew up the world again! "Well... At Least It Stayed Consistent." "Uhh, you said hit the RED button, right?" When your art is straight fire. "I TOLD YOU NOT TO PRESS THE RED BUTTON!!!" You love your panel, then you see the others. Life is like a game, and now, it's complete. Poor guy never got to see his game completed. I call this one "Bold and Brash"
Overuse of Fire & Ice theme may lead to DEATH. And the drawing was so ugly, everyone died. The very last Drawception game. Whoops! I pressed the wrong button! The real consequence for derailing. How it feels to be the last panel in the game. m-morty! don't press that... oh god morty. PSA: Review your games before mass extinction. It's the end of the game as we know it. When my laptop dies at the worst moment. This is why we don't intentionally derail. Kids, This is why you don't make paradoxes. The Drawception Game to end it all. Literally. Stop. Go Back. Zoom in. Enhance... LDИPUΞTEΩL! Let's take a look at the game! ... Never mind. Uh oh, looks like a panel got too many votes. NO! That's the button that'll kill everyone! The feeling of getting the final panel. That feeling when you finish the last panel. i have finished the game! next.. the world! Note to self: Don't view the completed game. DANGIT JERRY! WHY DID YOU DESTROY THE WORLD!? The game is finished. So is Earth. after your 3,000,000 drawception game. Hacking at Drawception has unexpected effect! And then, God said "Let there be LIGHT!" The Big Bang. Volume 2.
Who needs nukes? We got drawception! Submitting your masterpiece, only to be last. Oops. I think I broke the known universe. DONT CLICK THAT BLUE BUTTON!!!!!!!!! Drawception obtains the nuclear launch codes. The Earth's mind is BLOWN! That game was Earth shattering! That must have been a very bad drawing..
Tarkin: "You may Drawception when ready"
Drawception is infact a plot to slay humanity. Drawception, the world's next greatest weapon. When u draw & find out ur's is the last one. Be wary of what you submit. The world's reaction to Squeegee's drawing. Dang Barry, I told you not to eat those beans! Earth 'splodes because of extreme detail. Pagoda Box: All Routes Down. You should've have pressed the button, boi. Drawception art splits the earth apart. You make a bad drawing, and the world ends. You Drink. You Derail. You Die. Drawception, did you end the world again? Play Drawception & world goes KABOOM! Let me guess - you had to draw Donald Trump? God plays Drawception; creates Earth. World about to end? Play more Drawception! The final game is completed. View the game to see everybody's "art"
Drawception is here!! The end is near!! My submission blew up the internet! And earth. World explosion. Just kidding, it's Mario. Earth couldn't take it anymore and exploded. When lag deletes your drawception submission. Its the end of the draw as we know it! Drawception too awesome for earth! It all ends with a Drawception game. Ice and thermite don't mix. Art enchaning is the next popular technology. Don't click it. Or else. a game so good it will destroy your world! Playing Drawception will blow you away! Aaaand... Boom goes the dynamite. BREAKING NEWS: Drawception panel ends world? This is what you get for playing this game. Once you view the completed game, we all die! A long time in a galaxy, far, far away.. The aliens are trying to fit in..
Bottom of the barrel for 12/21/12 predictions. A Drawception game ends the world! Finally completing a drawing, world explodes! The completed game ends the world! The world ends when a Drawception game ends. "Don't view that! It will end us all!!!!!" Player derails a game, world implodes. Drawception creates a world impact. The rare earth fruit is sliced by the ninja! I told you not to press that button. A game SO EXTREME the earth blows up. The last Drawception panel until ThE eNd.. . .
And Then the World Exploded! Time travel only happens when it wants to. Played DC. Bucket list completed. The end. Best for last, and explosions. Drawception: the World Blowing Game! 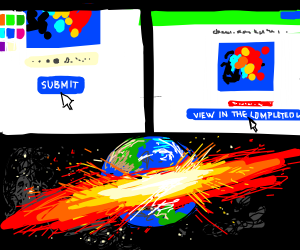 Earth Exploding Cause Someone Clicked "view"
Submitting the art, causing the world to die..
Nobody's Perfect! I gotta work it! Submitting a drawing of Earth exploding. The earth but with laser beam eyes! The earth explodes as soon as this game ends. Remember: View the Game, Destroy the World. Drawception - the Nuclear Football game! R.I.P Earth. A long time ago to 2017. This reality can't handle Drawceptionception. Clicking submit to drawing will end the world. The world ends with D(rawception), aw yee! Enter here to blow up planet Earth. Drawception ends the world as we know it. The Internet will one day destroy the world. A drawful game so epic the world ends! Drawception will divide our world! If you submit a panel, it will happen IRL. Watch your train wreck... become a cataclysm! Ohmagawd the earth blew up ohmagawd ruuuuuun!! THE EARTH EXPLODES ALONG THE EQUATOR LINE!!!!! World explodes from a submitted drawing. I'll explode your world,baby. With art!! The drawing that ended the world! HOw Did theY Even Make THat EveN?!?!?!?! Art so mindblowing so earth shatteringly good! Drawception can allow the end of the world! Enter your drawing and the world blows up! A Drawception game makes the world explode! TMW your Drawception drawing destroys Earth. Pollution caused Earth to explode. Planet getting blown in half. The world ends with a drawception game. Submitting a panel can cause Earth to Explode! A meteorite exploding in front of Earth.